Danish super group AQUA are coming to Canada on their first ever tour here. Joining them will be Canadian favourites PROZZAK and “Saturday Night” hitmaker Whigfield. 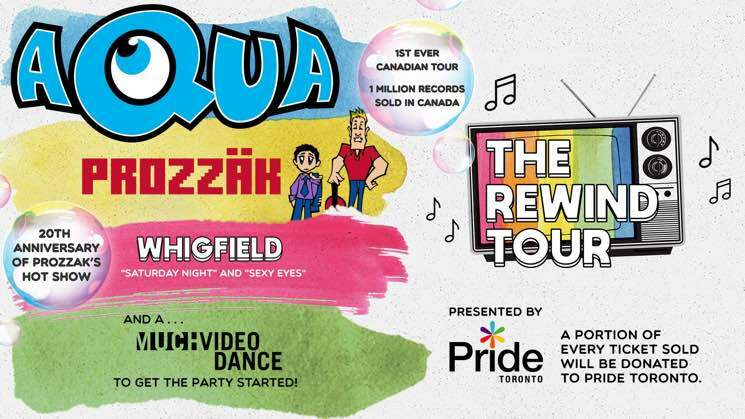 The killer 90s lineup will be bringing fans back to the era of video countdown’s and high school dance parties with a Much Music Video Dance Party to get things started. AQUA is Denmark’s biggest pop-act of all time, with an estimated 33 million records sold since 1996, and 1 million alone is Canada. AQUA are known best for their pop formula that produced highly infectious hit singles like ‘Barbie Girl’, ‘Roses are Red’, ‘My oh My’, ‘Doctor Jones’ ‘Turn back Time’, and ‘Lollipop Candyman’.